Pictarine Prints, available for Android through the Google play store, is a photo printing app that feels like an excellent blend of newer mobile tech and more traditional printing services. The app, and attached service, allows you to get 1 hour prints of any digital photo. You simply download the app, choose the photos that you would like to print, and the app will send them to a local Walgreens or Duane Reade pharmacy store (which you can choose yourself). After an hour has passed, you simply go over to the store and collect your photos. The great thing about this is the fact that you get the very best of both worlds. High quality physical photo prints without having to wait for a delivery, using the photos that you store online using modern methods such as Facebook and Instagram. It feels great to actually hold photos in your hand, and may even bring back a little of the excitement of waiting for your vacation photos to prints, something that modern technology has robbed us of. Pictarine Photos app is the home for all your photos. You can find photos fast and print them so easily. It’s the new photo gallery generation that thinks like you do and help your print whatever you want in a sec! Just connect your account and you can select photos from your Facebook, Instagram, Dropbox & Google. Enjoy our specific 4×4 or 8×8 photo paper sizes to print your Instagram photos. Receive Pictarine coupons and deals, exclusively for app users. 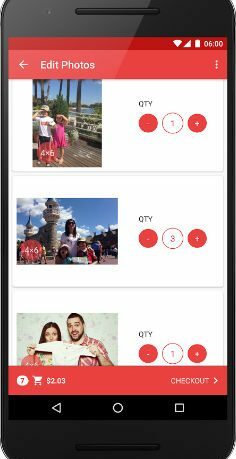 The app is very easy to use, and featured a well designed and intuitive interface that makes it very easy to choose the photos you want printed with your order. The photos are excellent quality, printed on high quality paper and feel much better to hold than many online print/delivery services. I like the way the app mixes traditional prints with modern smartphones, providing a great alternative to simply flicking through pictures on a screen while making the photos available as quickly as possible. This app comes very highly recommended as a great way to view and keep your pictures forever.